Cooking pea pods is not necessary since they are sweet and crisp when served raw, but some recipes call for them to be served hot. While steaming pea pods is the preferred method because it enhances their flavor and color without leaching out too many nutrients, you don’t need a steamer basket to cook pea pods to the desired crisp-tender state. A quick bath in boiling water or a few minutes in the microwave cooks them just fine. Wash your pea pods thoroughly and drain them in a mesh strainer. Break off the stem ends of the pea pods. Peel away the string that runs along the outer curve of the pea pods. Although the string is safe to eat, it’s also stringy and tends to get caught in teeth. Cover the bottom of a pot with about 1 inch of water. Season the water with salt to taste. Add a splash of lemon juice. You don't need much; about 1 to 2 teaspoons is fine. Put the pea pods into the boiling water all at once. Stand back a little so that you don’t get splashed with boiling water. Cook the pea pods, stirring them to make sure they all get into the boiling water, for 30 seconds to about 2 minutes. They are done when they turn bright green, but are still slightly crisp. Drain the peas though a mesh strainer. 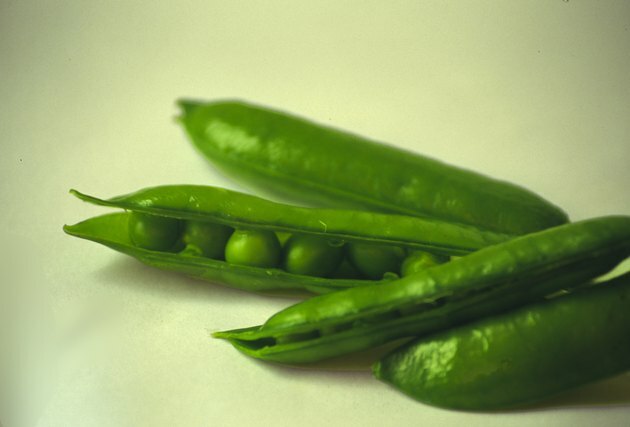 Place the peas in a microwave-safe dish large enough to hold them while piled no more than two pods thick. Drizzle olive oil to taste and toss the pea pods to coat them. Season the pea pods with your favorite herbs and spices and toss them again. Cover the dish with a paper towel and microwave them on high for 4 to 6 minutes, or until they are bright green but still a little bit crisp. For a bit of old-fashioned fun, have kids help you snap and string the pea pods. Never overcook pea pods or they will get mushy and limp.